Emboldened by a weak jobs report, Republicans today doubled down on their argument that Washington can't afford to increase taxes on Americans or businesses as political leaders seek ways to shrink the ballooning federal budget deficit. "Where are the jobs?" 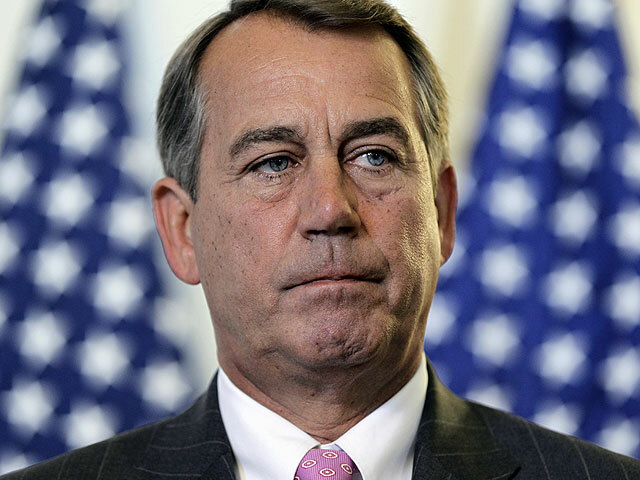 House Speaker John Boehner asked at a press conference today after the Labor Department reported that the the unemployment rate rose to 9.2 percent in June. The economy generated just 18,000 net new jobs last month, making it the slowest month for job creation in nine months. "Tax hikes on families and job creators will only make things worse," Boehner said, referring to the ongoing negotiations between White House and congressional leaders to forge a significant deficit and debt reduction deal. Mr. Obama met with congressional leaders on Thursday, seeking a deal that includes $4 trillion in budget savings over a decade. Republicans have insisted on creating a deficit and debt reduction plan as a condition of voting to raise the debt ceiling -- the amount of money that Congress is technically allowed to borrow. The president and his economic team have repeatedly warned of catastrophic consequences for the U.S. and global economy if Congress does not increase the $14.3 trillion debt ceiling by August 2. Another round of talks is scheduled for Sunday. Boehner said today he agreed that pressing the negotiations close to the Aug. 2 date "puts us in an awful lot of jeopardy." He said it was time to "do something big for our economy and, frankly, for our future" but added that there are still "serious disagreements" between Democrats and Republicans. "It's not like there's some imminent deal about to happen," he said. House Majority Leader Eric Cantor said that the debt talks that Vice President Joe Biden led for weeks failed because Democrats were "insisting we had to raise taxes." "If you look at the jobs report and the results of current policies and where we are in this economy, that's why the Biden talks had to end," said Cantor, the number two Republican. "It just does not make sense for Americans to suffer under higher taxes in an economy like this. There is no way the House of Representatives will support a tax increase." Democrats have called for raising tax revenues -- but in specific ways intended to avoid burdening the middle class, such as closing tax loopholes for industries like corporate jets and raising taxes on the highest-earning Americans. Boehner did not directly answer a question as to whether he would support closing tax loopholes in exchange for concessions from Democrats -- such as cuts to Social Security. The Ohio Republican simply replied, "At the end of the day we've got to have a bill we can pass through the House and the Senate"
Rep. Michele Bachmann, a Republican presidential candidate, also released a statement today tying the jobs report to the debt ceiling. Bachmann put the issue front and center in her first presidential ad, released this week, in which she repeated her pledge to vote against raising the debt limit. "Amidst this economic freefall, it should not be lost that the architect of the president's failed economic policies, (Treasury Secretary) Timothy Geithner, will head for the door after he attempts to cement the president's legacy of massive spending and debt by raising the debt limit another $2.4 trillion dollars," Bachmann said in her statement today. "We can only hope that the president will be right behind him after the next election."